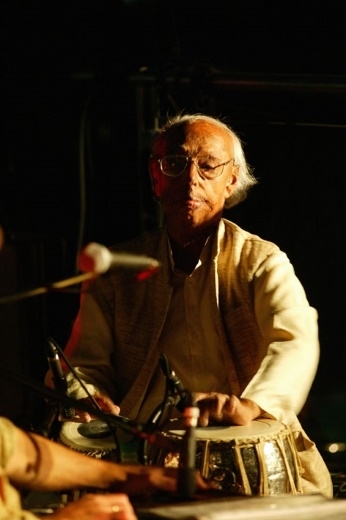 Born in 1924 in the East Bengal part of North India, the musician, composer and teacher Pandit Kamalesh Maitra first came to Berlin in the mid-seventies. He was a great pioneer of Indian music in the West, who dedicated himself to continuing in the footsteps of the great innovators Allauddin Khan, his son Ali Akbar Khan, and the brothers Uday and Ravi Shankar. Having had a career spanning several decades as master of the melody instrument tabla tarang, as a sarod and tabla player, as composer and never-tiring teacher, Kamalesh Maitra made an invaluable contribution to Indian music in Germany and the world. In 1974, Ravi Shankar and George Harrison took him on the highly acclaimed tour of the Musical Festival from India, and two years later he was invited to perform at the legendary Metamusik Festival in Berlin. He moved to this city in 1977 and, parallel to an active concert schedule, taught classical Indian vocal and instrumental music here. In memory of this ingenious musician and revered personality who passed away now 14 years ago, we cordially invite you to attend a concert with the two groups he himself initiated, the Tabla Ensemble, now named after him, and his own Ragatala Ensemble. Der Musiker, Komponist und Lehrer Pandit Kamalesh Maitra, geboren im Jahr 1924 im ostbengalischen Teil von Nordindien, kam zum ersten Mal in den 1970er Jahren nach Berlin. Er war ein Pionier der indischen Musik im Westen, der das musikalische Erbe der großen Innovatoren Allauddin Khan, dessen Sohn Ali Akbar Khan und der Brüder Uday und Ravi Shankar hingebungsvoll weiterführte. Über mehrere Jahrzehnte als Meister des Melodie-Instrumentes Tabla Tarang, als Sarod- und Tabla-Spieler, als Komponist und unermüdlicher Lehrer tätig, leistete Kamalesh Maitra einen unschätzbaren Beitrag zur indischen Musik in Deutschland und der Welt. Im Jahr 1974 ging er zusammen mit Ravi Shankar und George Harrison auf Tournee mit dem Musical Festival from India, zwei Jahre später wurde er zum legendären Metamusik-Festival nach Berlin eingeladen und zog 1977 hierher. Parallel zu seiner aktiven Konzert-Tätigkeit lehrte Kamalesh Maitra seitdem klassischen indischen Gesang und Instrumentalmusik in Berlin.In Erinnerung an diesen genialen Musiker und die verehrte Persönlichkeit, die vor nunmehr 14 Jahren verstarb, laden wir Sie herzlich ein zu einem Gedenkkonzert mit zwei Gruppen, die er selbst ins Leben gerufen hat.